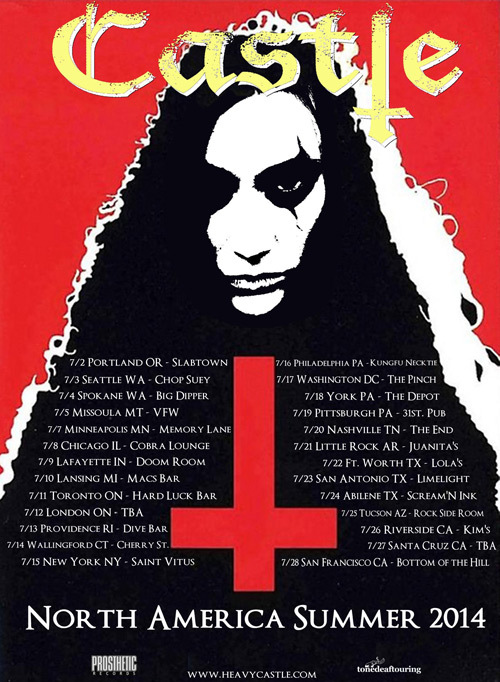 Following a successful headlining jaunt throughout the United States to kick off the touring cycle for new album Under Siege, heavy metal/doom enthusiasts CASTLE have announced another month’s worth of dates throughout the US and Canada. The band, which features vocalist/bassist Elizabeth Blackwell and guitarist Mat Davis, will be rounded out by drummer Will Carroll (Death Angel) for the trek, which kicks off in Portland on July 2. A current listing of dates can be found below. Consisting of eight tracks of riff-driven melodic metal, Under Siege, CASTLE‘s third full-length, was released in North America via Prosthetic Records, in Europe by Ván Records and you can read Guido’s review HERE. Under Siege is available in North America from Prosthetic Records HERE and in Europe via Ván Records on CD or LP with Digital Downloads available from iTunes HERE.